Last night I was sitting on the couch trying to think of an easy way to add polka dots to my nails. Then it came to me! I had a sharpie paint pen that I just bought for another awesome project and it would do the trick for my nails. You can find Sharpie Paint Pens at Michaels. If you use your coupon they are only about $2! They come in all different colors too. I chose water based Metallic Gold! The nail art options are endless with these bad boys and so easy to use. It also dries super fast! 1. Paint your nails any color and allow them to dry completely. 2. 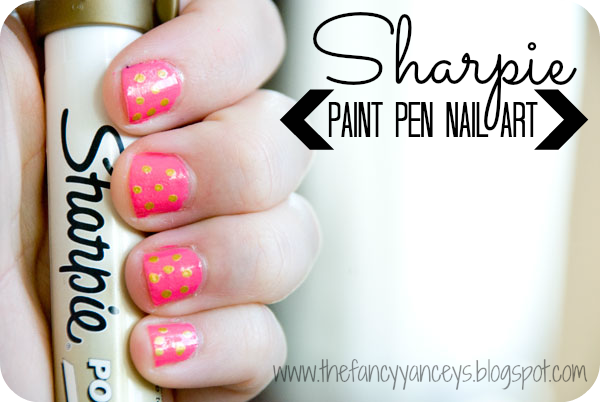 Draw or dot your design with the Sharpie paint pen and let dry. 3. Add a clear coat and your're good to go!